The Sewing Diet: Friday Update! I will most likely be fabric shopping in the next week or so. There is so much thought, for me, that goes into the garment. I want to keep the integrity of the time period with the design, but I am hoping to put a more modern flair with the fabric. The weekend is here! I have been looking forward to the weekend all week! As I mentioned in a previous post, it's funny how (for me anyway) I am always counting down to the end of the day on Friday. I usually like to just go home, have a nice dinner and relaxing on the weekend. There will be a lot of football going on in my house this weekend.. Super Bowl Weekend. Do we have any football fans out there? 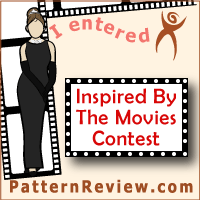 So I mentioned in my post Don't Stop- Keep it Coming, that I recently committed myself to participating in the www.patternreview.com contest, Inspired by the Movies. I have finally chosen the pattern. It is the Butterick 5556 Retro pattern. It is: Lined dresses mid-calf, have semi-fitted bodice and gathered, flared skirt, winged or stand-up collar, below elbow kimono sleeves, side zipper and side front pockets. Self-fabric belt has purchased buckle. Purchased petticoat. This pattern will provide me with a number of challenges including the multiple darts and the belt. I have never made a "petticoat" before, so that will be interesting as well. If anyone out there has made a petticoat please let me know---where do I start? great video tutorials? books?